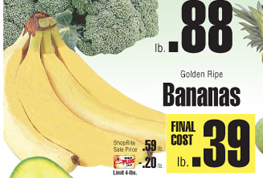 RuReady4Savings: Bananas 39¢ lb and more! Bananas 39¢ lb and more! you CAN PRICE MATCH the ShopRite ad @ Walmart. ShopRite has lots of great prices every week! Bananas on sale for 39¢ lb. Walmart is usually around 56¢ lb. and tons of other great sales. because they double coupons up! you can Save daily just by Price Matching Stores around you!